Prior to factory-made trusses and metal rafter brackets, every framing carpenter knew how to cut a "bird's mouth" or "bird's beak." A bird's mouth is simply a notch that allows a rafter's underside to sit flat on a wall's top plate. Although the bird's mouth concept is simple, the mathematics behind the operation tend to trip up the novice carpenter. To cut a bird's mouth in rafters, you must know the desired slope -- or pitch -- of your roof and the desired overall length of an individual rafter. Armed with this information, you can use a carpenter's rafter table and framing square to layout the location of all the rafter cuts, including the bird's mouth. Calculate the pitch of your roof. Pitch = rise / (run x 2). Rise is the vertical distance from the top plate of the wall to the peak of the roof. Run is the horizontal distance from the top plate to a point perpendicular with the center of the roof. Multiply your pitch by 24 to determine the rise per foot of run; the result of this equation represents the amount of inches that your rafter slopes upward for every foot that it progresses sideways. Consult a rafter table to determine the overall length of your rafter. Rafter tables require two pieces of information: rise per foot of run and total run. Find the column on the rafter table that represents your rise per foot of run. Most rafter tables express this value as x-inches in x-inches. For example, 3 inches in 12 inches represents a rise of 3 inches per foot of run. Follow the proper column to the row that represents your roof's run. The value at the intersection of the proper row and column represents the length of a rafter, excluding overhang. 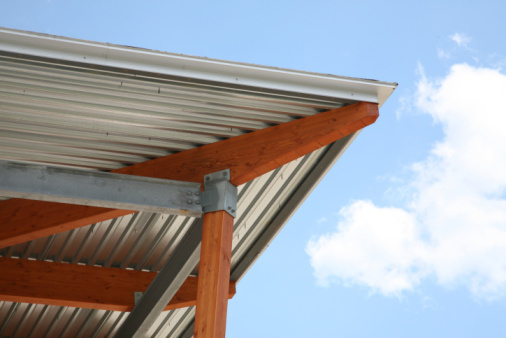 Add the desired overhang to this value to determine the overall length of your rafter. Lay a framing square on top of your rafter lumber and position the square at one end of the board. Hang the heel of the square over the edge of the board; the heel is the outer corner between the blade (the long side of the square) and the tongue (the short side of the square). Turn the square so that the blade faces the opposite end of the board. Find the 12-inch mark on the blade and position the 12-inch mark onto the edge of the board; the heel must remain hanging over the edge. On the tongue, find the inch mark that represents your rise-per-foot of run; position this mark onto the edge of the board. 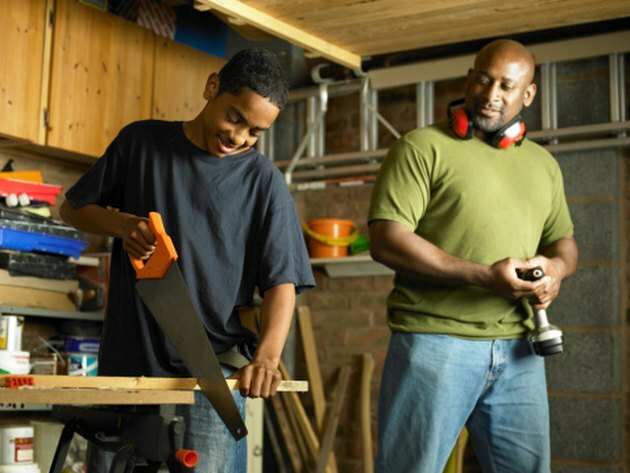 Run a pencil along the outside edge of the tongue to lay out a line across the rafter's surface; this line represents the upper plumb cut, the cut that connects to the roof's ridge board. Pull a tape measure along the top edge of the rafter. Beginning at the top of the upper plumb cut line, stretch the tape measure the length of the rafter, excluding overhang. Use a pencil to mark the length of the rafter on the board's surface; this mark allows you to lay out the plumb cut, or vertical cut, of the bird's mouth. Draw a line beneath the mark that represents the plumb cut of the bird's mouth. This line represents the depth of the bird's mouth. The line must be parallel with the edge of the board, less than half the width of the board and closer to the lower edge of the rafter. Remember this depth and use it for every rafter. Position the square's heel over the mark that represents the bird's mouth's plumb cut so that both the tongue and blade of the square run through the depth line. Find the value that represents your rise-per-foot on the tongue. Position this value on the edge of the board. Find the 12-inch value on the blade and position it over the edge of the board. Run a pencil along the inside edge of the square's tongue to lay out a line that runs from the board's edge to the depth line; this line represents the bird's mouth's plumb cut. Flip the square so that the heel hangs over the board's edge, and position the square exactly the same way as during the layout of the rafter's upper plumb cut. Slide the square's blade until it crosses the intersection of the bird's mouth's plumb cut line and the depth line. Run a pencil along the outside edge of the tongue until it meets the bird's mouth's plumb cut line; the resulting triangle is the bird's mouth. Cut out the triangular chunk almost to its apex with a circular saw. Use a hand saw to sever the chunk from the rafter at its apex. How Do I Know Where to Cut the Bird's Mouth in a Rafter?